These are attacks on computer systems and networks based on exploiting hardware design or manufacturing bugs, or "not playing by the rules" in dealing with the hardware. The idea of violating the "rules" by freezing the semiconductors or overwriting Ethernet firmware data seems analogous to the very common software vulnerabilities caused by not fully validating user input. Well, maybe not just analogous, maybe we should consider frigid liquids or Firewire signals or Ethernet signals as user-supplied input just like packet contents or form data submitted to web servers. What makes these different is that we don't generally have control of the hardware design and manufacturing. Yes, you could choose to buy an Ethernet card or CPU or motherboard from a different manufacturer, but you have to choose from the existing market. What if you can't trust the semiconductor manufacturer? Then you can't trust anything! The paper "Stealthy Dopant-Level Hardware Trojans: Extended Version" in the Journal of Cryptographic Engineering looked at undetectable backdoors built into chips. While there are some interesting open-source hardware projects, they are the exception and do not generally provide the features and performance needed. Enthusiasts must not forget that corporations and government agencies require well-known and trusted hardware manufacturers. badBIOS — real or not? In early January 2018 we learned that effectively all Intel CPUs and many AMD and ARM CPUs since 1995 have hardware flaws. They do not really enforce isolation between user applications and the operating system. The kernel memory leak flaw allows a user process to read memory pages of other processes and of the kernel itself. This can expose cryptographic keys and other sensitive data. When a CPU reaches a conditional branch in the code, something like if (condition) ..., it tries to predict which branch will be taken before the decision is known. If its prediction was correct, it will have already executed a block of code before the decision is known. If not, execution rolls back and follows the correct branch instead. Modern processors are good at this "speculative execution" because they store details about previous branch decisions in the BHB or Branch History Buffer. While this often leads to the correct decision, the conditional statement may be security-critical. The roll-back at incorrect predictions doesn't include cache and the Branch History Buffer. That's because the speculative execution is done for performance reasons, and rolling back cache and BHB would hurt performance. These mechanisms are abused in the "Spectre" and "Meltdown" attacks. The Spectre attack paper describes two exploits: (1) reading kernel memory from user space when running on bare metal, and (2) reading host kernel or hypervisor memory from kernel space on a VM. The Meltdown attack paper describes an additional exploit, also reading kernel memory from user space when running on bare metal. "MeltdownPrime and SpectrePrime: Automatically-Synthesized Attacks Exploiting Invalidation-Based Coherence Protocols"
"BranchScope: A New Side-Channel Attack on Directional Branch Predictor"
NVD: CVE-2018-3639 NVD: CVE-2018-3640 NVD: CVE-2018-3693 Alert TA18-141A: Side-Channel Vulnerability Variants 3a and 4 Oracle's Eric Maurice on CVE-2018-3640 ("Spectre v3a") and CVE-2018-3639 ("Spectre v4") Oracle's Eric Maurice on CVE-2018-3693 or Bounds Check Bypass Store "Speculative Buffer Overflows: Attacks and Defenses"
The post "x86 is a high-level language" from 2015 explains why these exploits are possible. The 1995 paper "The Intel 80x86 Processor Architecture: Pitfalls for Secure Systems" listed, among other security flaws, "Prefetching may fetch otherwise inaccessible instructions in virtual 8086 mode." This bug allows the floating point register content to be leaked from another process. Unfortunately, those registers are also used for cryptographic operations. The bug is present on Intel Core based microprocessors from the Sandy Bridge architecture up to the bug announcement of June 2018. Register content can be saved and restored when switching from one process to another, but this takes time. This can be done "lazily" (that is, when needed) as a performance optimization. This bug was fixed in the Linux kernel at release 4.9 (Dec 2016) by defaulting to "eager" (and safe) floating point restores on all x86-64 processors from around 2012 and later. Windows 10 and Server 2016 are believed to be safe, although Server 2008 needs a patch. Current OpenBSD and Drangonfly BSD are safe, and FreeBSD has a fix. The FreeBSD kernel discussion (see the thread SSE in libthr shows how this type of problem arises. Someone finds a clever hack that improves performance by a few percent in a specific situation. That goes into place despite it not helping the majority of cases. Then someone finally notices that the change can be abused. Red Hat back-ports fixes in the Linux kernel and applications. Especially with the kernel, the release number doesn't mean what you would assume it means. It would take a lot of work to figure out what all they have changed. RHEL 7 already had the fixes in place despite apparently having a kernel that describes itself as much older than 4.9. The RSB or Return Stack Buffer is another specific target in speculative execution attacks. In July 2018, researchers at University of California, Riverside announced what they called SpectreRSB, a "Spectre-class" attack on the RSB. The attack allows modification of the return address pointer, and recovery of data from other processes running on the same CPU. It can expose data outside an SGX or Intel Software Guard eXtensions enclave. Intel says that this is related to CVE-2017-5715, the Branch Target Injection vulnerability. Christopher Domas demonstrated an x86 processor backdoor at the 2018 Black Hat USA and DEF CON meetings. It allows Ring 3 (user space) code to circumvent processor restrictions and read and write Ring 0 (kernel) memory. The backdoor is enabled by default on some processors. This "Rosenbridge" backdoor is a small CPU core embedded alongside the main x86 core. It is controlled by one of over 1,300 undocumented model-specific registers (or MSRs) built into the processor. This secondary core has its own independent architecture, but shares parts of the instruction pipeline with the main core. The vulnerable processors are used in various older desktop, laptop, and embedded systems. The NSA maintains an official Github account. Among other things, they provide guidance on these classes of vulnerabilities. The paper Intel x86 Considered Harmful is an excellent discussion of an architecture that is overly complex for what it provides. The complexity provides too many opportunities for vulnerabilities. The paper has a great description of the firmware, the peripherals, networking, USB, graphics, disk and storage controllers, audio devices, video devices, and other potential points of attack and defense. Can these be audited? That isn't practical. In March 2018 CTS Labs announced what they called a "Severe Security Advisory" about vulnerabilities in AMD's Ryzen and EPYC product lines. The describe the problems as four classes of attack. Given administrative-level privileges on the system, an attacker could plant malware that would persist not only through reboots but also reinstallations of the operating system. Then only shared the information with AMD one day before releasing it, versus the typical disclosure window of at least a few months. And, their paper has very little technical detail. On top of that, their website contains a disclaimer that CTS Labs may have "an economic interest in the performance of the securities of the companies whose products are the subject of our reports." The attacks, to the extent they're described, exploit vulnerabilities in AMD's Secure Processor and in a peripheral controller chipset sold by ASMedia. The debugging backdoors are built into the hardware, meaning they can't be fixed, only replaced. There were some interesting short articles about Intel Core 2 bugs, see here and here for the articles, and also see the background on Intel's quiet patch release. Affected CPUs were the Core 2 Duo E4000/E6000, Core 2 Quad Q6600, Core 2 Xtreme QX6800, QX6700, and QX6800. Remember the Pentium CPU's that were bad at floating-point division? For some Pentium CPU's, a block of machine code starting 0xF00F will just plain halt it. On 4 October 2018 Bloomberg Businessweek published The Big Hack: How China Used a Tiny Chip to Infiltrate U.S. Companies. The article quickly came under heavy criticism, with little effective support from Bloomberg. The article said that Amazon had found in 2015 that motherboards from Supermicro, one of the leading suppliers, included "a tiny microchip, not much bigger than a grain of rice, that wasn’t part of the boards’ original design." The chip is said to have been inserted at manufacturing subcontractors in China. It supposedly creates a backdoor. Or, far more likely than an inbound connection that outsiders couldn't reach, an active exfiltration channel. China "by some estimates makes 75 percent of the world’s mobile phones and 90 percent of its PCs." The article says that "three senior insiders at Apple" say that Apple also found malicious chips on Supermicro motherboards in the summer of 2015. Apple had planned to order 30,000 Supermicro servers for a global network of Apple data centers. Bloomberg cited "six current and former national security officials" backing up the story. The article was accompanied by "artist's conception" artwork that many misinterpreted as actual photographs. There is some obvious nonsense in the Bloomberg story. Their example of how it might work speculates about "the Linux operating system" and confuses the kernel, the operating system itself, with user-space programs that check user passwords. The article has been made friendly for non-technical readers, with "artist's conceptions" of what might have been. The result is that you don't know if they made the technical parts wrong to make them easier for non-technical readers, or if they're simply wrong to start with. Amazon, Apple, and Supermicro published detailed rebuttals of the Bloomberg story. Here's a good summary from the Grugq. Immediate analysis included this initial SecuringHardware.com Twitter thread converted into a single page. See this excellent piece on counterfeit electronics (from 2011, when there had just been a scare about the U.S. DoD supply chain). It explains the many forms of counterfeit, remarked, refurbished, and simply re-used parts. You don't need elaborate sinister conspiracies to explain hardware mysteries. Amazon soon said "There are so many inaccuracies in this article as it relates to Amazon that they’re hard to count." The National Cyber Security Centre, a unit of GCHQ, soon agreed with Apple and Amazon that Bloomberg was wrong. Before long, The Atlantic had an article about how even if the story is wrong, at least we can learn a lesson about supply chain trust. IEEE published an article about automated hardware inspection. As several pointed out, Bloomberg has a track record of sensational but incorrect stories about hacking and cyberwar. The same reporters claimed in 2014 that the US government knew about the Heartbleed bug, and then refused to correct the story, follow up, or even comment. Bloomberg published a sensational cyberwar story about a Turkish pipeline explosion in 2014 that technical experts and the intelligence community said was wrong, but Bloomberg never retracted it. Academic researchers published a draft paper reporting that a wide range of solid-state drives fail to encrypt data in any meaningful way. Microsoft's BitLocker turns off software file system encryption in the operating system if the drive claims to handle it. So, many users who had enabled BitLocker had nothing but a false sense of security. Within a few days Microsoft had published a workaround and US-CERT had issued a warning. If the hardware won't even do what it's supposed to, there are big problems! Infineon Technologies AG builds some secure hardware chips. They built their RSA library 1.02.013 into TPM chips starting in 2012. Unfortunately, that library and thus the chips generates RSA keys that can be factored in practical attacks. 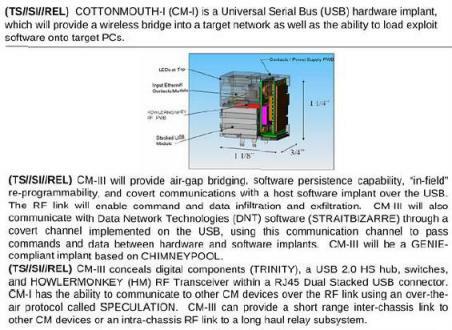 The vulnerable hardware had NIST FIPS 140-2 and CC EAL 5+ certification. The vulnerability was discovered in early 2017 and disclosed to the vendor, then announced 8 months later as CVE-2017-15361. Also see the research group's discovery report and their paper with the details. They looked at the amount of CPU time required to factor the faulty keys, and converted that to US dollar cost on the Amazon AWS c4 computation platform. A 512-bit RSA key would cost just $0.06 to break. 1024-bit RSA keys would cost $40-80, and 2048-bit keys $20,000-40,000. The chips have been built into products sold by a wide range of vendors. Two weeks later, Daniel J. Bernstein and Tanja Lange announced even faster attacks. Researchers at ESET announced in late December 2018 that they had discovered the first example of a UEFI-based rootkit. The group known variously as APT28, Sofacy, Fancy Bear, and Sednit had recently started using this. The researchers call the rootkit LoJax, as it's based on Absolute Software's LoJack recovery software. It takes advantage of firmware vendors allowing remote re-flashing of firmware. Radare is a portable reverse-engineering framework and tool set that runs on Linux, OSX, ANdroid, Windows, Solaris, and Haiku. The Intel Management Engine is a microcontroller that handles data transfer between the processor and peripherals. In May 2017 researchers discovered a remote code execution vulnerability (tracked as CVE-2017-5689) in this controller. In August 2017 they discovered an undocumented setting to disable the controller. "Experts found an undocumented Kill Switch in Intel Management Engine"
Later in 2017 we learned that the Management Engine runs MINIX with a full network stack and a web server. This is down at Ring –3. That is, "minus 3", three levels below what your kernel can see. Intel's SGX or Software Guard Extensions was intended to provide a secure enclave protected even from the Management Engine. Another term for this is a Trusted Execution Environment. Well, it wasn't secure after all. Intel refers to the vulnerability as L1TF or Level 1 Terminal Fault. See the Foreshadow speculative execution attacks. The original version extracts data from the SGX enclave. The next-generation version can extract any data in the L1 cache, including memory in use by virtual machines, hypervisors, the operating system kernel, and System Management Mode (or SMM) memory. CVE-2017-5703 describes a vulnerability in Intel's SPI Flash memory, a component of several Intel CPU series. An attacker could use this vulnerability to block BIOS/UEFI updates or selectively erase parts of the firmware. There was concern back in 2006 about an ACPI/BIOS based attack. The Rakshasa software collection can reflash firmware. software collection Rakshasa can reflash firmware, "Black Hat: Researcher Demonstrates Hardware Backdoor", Dark Reading July 2012 "Researcher creates proof-of-concept malware that infects BIOS, network cards"
"New Malware Can Bypass BIOS Security", can fool a host's Trusted Platform Module into thinking that the BIOS firmware is clean when it isn't, Dark Reading May 2013. "Research Into BIOS Attacks Underscores Their Danger", Dark Reading Nov 2013. The Computrace / Absolute Track / LoJack system seems like it's either rootkit or backdoor. Read the CoreSecurity review and see the related Black Hat presentation. FireEye identified malware modifying the Volume Boot Record, hijacking the system boot process. FireEye calls the group "FIN1", which they speculate is located in Russia or at least the group largely speaks Russian. FireEye calls the specific software "BOOTRASH", it's part of an overall system that its developers call "Nemesis." FIN1 is targeting payment card data for financial gain. ArsTechnica also covered the story with comparisons to other so-called bootkits. Ben Hawkes' Notes on Intel Microcode Updates discusses how updateable CPU microcode exists to work around hardware and firmware bugs. There is speculation that malicious changes might be able to move sensitive data to a known location, but Hawkes' work shows there are RSA digital signatures, using SHA-1 on older processor models and SHA-2-256 in newer processors. The firmware is proprietary so we have no "known good" for comparison. Plus, as the U.S. Government has demonstrated, they have no interest in closing this particular security hole. BadUSB is an attack on the firmware controllers in typical USB devices. Malware on the system can subvert an attached USB device, and a hostile USB device can attack a system into which it is plugged. Practical BadUSB attack software is available. The Rowhammer vulnerability in DRAM devices is based on repeatedly accessing a row in high-density DRAM devices and flipping bits in adjacent rows. A Google team has demonstrated and documented using this to gain kernel privileges. The good news is that it's a much larger challenge to flip the bits in a constructive way that provides access for the attacker. The NX bit, also called the XD bit, is used by CPUs to enforce memory segregation into instructions versus data. Intel calls it XD for eXecute Disable, AMD calls it Enhanced Virus Protection, and ARM processors call it XN for eXecute Never. This feature is enabled as a BIOS setting, and so it would appear to be down in the hardware where neither applications nor the operating system can reach it. But... The NX bit is simply a hardware feature that may or may not be available. Even if available, the operating system may not use it. For example, in Windows, Data Execution Prevention or DEP is Microsoft's name for support of this technology in the operating system. This page explains how to turn it on for specific programs or for all programs. See the Wikipedia page on the NX bit for detailed descriptions of the technology and its support on various combinations of operating systems and processors. In February, 2010, Christopher Tarnovsky announced a successful hardware exploit of an Infineon TPM chip. University of Illinois researchers exploited a system by modifying its processing hardware. With Linux running on a programmable LEON processor, based on Sun's Sparc design, they changed 1,341 of the over 1 million logic gates. A carefully crafted network packet injected the malicious firmware, and the attacker could then login as a legitimate user. Note that this would require a processor programmed with an OS with malicious hooks — this seems far-fetched but US DOD warned of this very attack in February 2005 because a shift toward overseas integrated circuit manufacturing could present a security problem. This was reported at the Usenix Workshop on Large-Scale Exploits and Emergent Threats in April 2008, and described in this IDG News article. See "Stealthy Dopant-Level Hardware Trojans", a paper discussing how to tamper with logic gates by changing the doping of one transistor. This sabotage would be undetectable by optical inspection or functional testing. There's been some work on attacking the firmware on network interface cards, some of which focuses on permanently damaging the card. But more interesting work looks at attacking the NICs on a firewall so they do PCI-to-PCI data transfers, moving information down at a hardware level where firewalls don't look. There is speculation this might allow reading the disk device through its PCI-based controller. See this discussion, referencing an excerpt from the Robust Open Source mailing list. Kristian Kielhofner's Packets of Death describes how problems with Intel's 82574L Ethernet controller has vulnerabilities: "death packets" containing the correct pattern can shut down an interface. It turns it off — the link lights on the card and the switch go out and only a power cycle can turn it back on. The "kill code" data pattern can be in the application layer payload, so a hostile HTTP server could put the pattern in an HTTP 200 response and shut down client machines behind a firewall. Storage devices, both rotating magnetic disk and solid-state drives, have their own controllers. That is, the SATA or SCSI or whatever interface has its own processor with firmware, but the storage device itself also has one. The SATA/SCSI/etc interface is on the motherboard or an expansion card, the drive controller is inside the small box containing the drive. Most of these are ARM and MIPS controllers. Some of the firmware is stored in an embedded flash chip, the rest is on hidden sectors of the disk. They include 8051 and H8 processors. Ectool is a small utility that dumps the flash RAM of a laptop's Embedded/Environmental Controller or EC, typically an 8-bit or 16-bit processor. Synaptics TouchPads use an AVR or PIC architecture. Intel Active Management Technology or AMT is part of the Intel Management Engine, built into systems with Intel vPro technology. It's intended for remote out-of-band management. Intel ME Secrets: Hidden code in your chipset and how to discover what exactly it does. An embedded server called the BMC or Baseboard Management Controller is installed on server motherboards. The BMC typically runs Linux on its own small CPU with memory and storage, and runs independently of the operating system or hypervisor you think of as being installed directly on the system. IPMI and the BMC provide networked access to the hardware even when the system is powered down. CVE-2017-9417 is a heap overflow on Broadcom Wi-Fi chips, triggered by a packet with a WME (Quality-of-Service) information element with a malformed length. An article in Der Spiegel describes a 50-page internal "product catalog" from an NSA division called ANT, listing hardware and software (called "implants" in NSA terminology) which can penetrate systems to monitor, modify, and extract information. 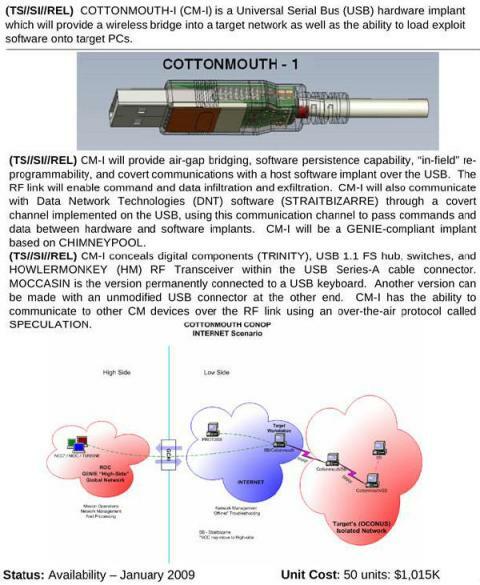 These include modified cables allowing "TAO personnel to see what is displayed on the targeted monitor", USB plugs and cables that covertly communicate over radio links (see the COTTONMOUTH device at right), replacement USB and Ethernet ports with covert data capture and communications built in, replacement chips and daughter cards to exploit the motherboard BIOS and using System Management Mode to reload itself at every boot, up to active GSM base stations that mimic legitimate mobile phone towers and therefore monitor and even control nearby mobile phones. ANT also attacks the firmware in disk drives manufactured by Western Digital, Seagate, Maxtor, and Samsung, and modifies hardware and/or firmware in Cisco, Juniper, and Huawei routers and firewalls. Cryptome has the full NSA ANT catalog available for download. A Wired article also discusses the catalog. The router and firewall backdoors work by subverting the hardware's boot ROM, re-installing themselves every time the system starts and running below the operating system itself. 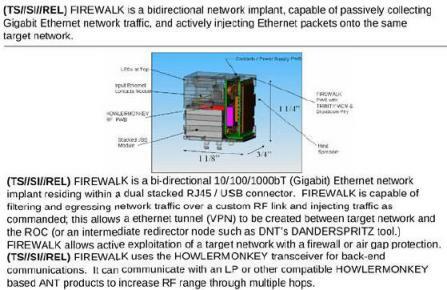 HEADWATER is a persistent backdoor software implant for selected Huawei routers. SCHOOLMONTANA, SIERRAMONTANA, and STUCCOMONTANA are persistent backdoor software implants for all modern versions of JUNOS, a version of FreeBSD customized by Juniper. They are for J-Series, M-Series, and T-Series routers, respectively. FEEDTROUGH is a persistence technique for two software implants, BANANAGLEE and ZESTYLEAK, used against Juniper Netscreen firewalls. GOURMETTROUGH and SOUFFLETROUGH are used against other Juniper firewalls including the SSG 300 and SSG 500. JETPLOW is a similar product for Cisco PIX and ASA firewalls, HALLUXWATER is for Huawei Eudemon firewalls. 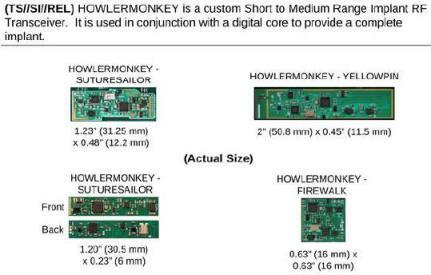 HOWLERMONKEY variants are RF transceivers to exfiltrate data from air-gapped systems. Other ANT products are miniaturized digital cores packaged in multi-chip-modules, basically miniaturized computers running full operating systems like the Raspberry Pi but concealed beneath a chip on the motherboard. The badBIOS story appeared in October, 2013. Dragos Ruiu told about very advanced malware that infected both Mac and PC hardware, reflashing the BIOS, UEFI, or EFI firmware, spreading via ultrasound or signals from software defined radios, traveling in USB memory sticks that were merely plugged in but never mounted..
Ars Technica 31 Oct 2013 "Meet 'badBIOS,' the mysterious Mac and PC malware that jumps air gaps"
InfoWorld 1 Nov 2013 "BadBIOS: Next-gen malware or digital myth?" Ars Technica 5 Nov 2013 "Researcher skepticism grows over badBIOS malware claims"
People following this story fall into a few different camps. Many believe everything he says — or at least most of it — is true. Others think he's perpetrating a huge social engineering experiment, to see what he can get the world and the media to swallow. A third camp believes he's well-intentioned, but misguided due to security paranoia nurtured through the years. A few even think we're witnessing the public mental breakdown of a beloved figure. They point out that paranoid schizophrenics often claim to be targeted by hidden communication no one else can hear. To be honest, I've found myself in all these camps since the story broke, though I'm leaning toward those who think Ruiu is well-intentioned, but perhaps seeing too much of what he wants to see. Is Your Hardware Really What You Think It Is? There have been stories of counterfeit hardware from Cisco modules down to integrated circuits for some time. The first thing I noticed explaining just how these parts get into the parts supply stream was this Business Week article, "Dangerous Fakes", subtitled "How counterfeit, defective computer components from China are getting into U.S. warplanes and ships". Even If You Have AMD Hardware, Is It Really What You Thought It Was? All AMD processors made during 2000-2010 included a secret debugging feature well outside the standard x86 architecture definition. All processors starting with the Athlon XP have a firmware-controlled feature that can put the CPU into debugging mode. 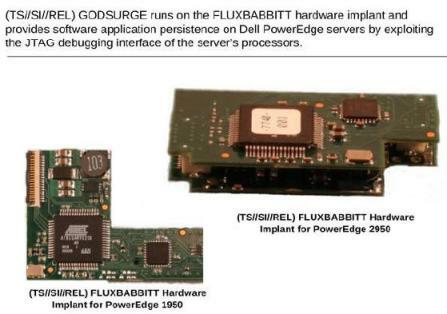 See the article in The Register for an overview, the announcement by the discoverer for far more details, and this list of undocumented Machine Specific Registers in AMD processors. Although the Cisco products with this component are currently performing normally, we expect product failures to increase over the years, beginning after the unit has been in operation for approximately 18 months. Although the issue may begin to occur around 18 months in operation, we don't expect a noticeable increase in failures until year three of runtime. Once the component has failed, the system will stop functioning, will not boot, and is not recoverable. Others reported the problem on Synology storage devices and various products from Dell, HP, NEC, NetGear, SuperMicro, and other manufacturers. The problem seems to come from the Intel Atom s2000 SoC, as indicated by Intel's Specification Update, which stated that its clock may stop functioning and the SoC will no longer boot. The parts started shipping in 2013. VirtualBox is a virtualization product that used to be from Innobox, which was purchased by Sun, which was purchased by Oracle. See this message from the OpenBSD project leader reporting that CPU registers become corrupted under VirtualBox. "We don't know how other operating system products continue running when the userland ecx register gets clobbered on a return from a page fault, but at least people should be aware that there is likely some security risk from running that product. That VM does not emulate the x86 correctly, (either)." See my page on Violating Virtualization Security for more information on Type 1 and Type 2 virtualization vulnerabilities, VM escape, the use of malicious hypervisors, and more. The IT security department of the Economic Development Administration within the Department of Commerce ridiculously over-reacted and spent over $2.7 million destroying $170,000 in hardware including desktop computers, cameras, printers, keyboards and even mice after they were informed of a potential malware infection. They would have destroyed even more hardware but they ran out of money to continue the idiotic operation. See the Network World overview and the official Office of the Inspector General report for further details.